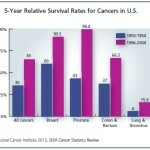 The 5-year survival rate for localized breast cancer, is 98%--an 18% increase since the 1950s. Silver BookThe 5-year survival rate for localized breast cancer, is 98%–an 18% increase since the 1950s. The 5-year survival rate for localized breast cancer, is 98%–an 18% increase since the 1950s.